cheese, no sour cream and to be honest I probably wouldn’t even risk the guacamole (the bottled, un-refrigerated stuff usually contains dairy). 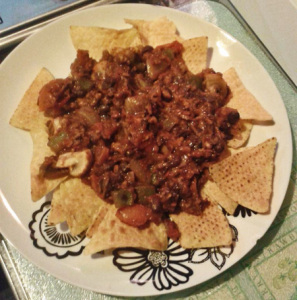 So if a veg*n chilli isn’t available on the menu, that would leave me with chips and maybe some tomato salsa. Hmpft. However, that doesn’t stop me chowing down on nachos of epic proportions at home! Introducing my Ultimate Nachos… tortilla chips, mouth-watering “chilli sin carne”, lashings of realistic cheezy sauce and a generous helping of sour cream. Definitely one of my favorite weekend treats! I like to use as many different types of tomato as possible to give a nice depth of flavour. Tomato ketchup is my dirty secret ingredient – perfect for adding a hit of sweetness. 2 x tsp chopped red chilli (the strength is up to you! *I always have a bowl of grated veggies in my fridge, usually consisting of any combination of carrot, white cabbage, red cabbage, celeriac, suede etc. This comes in so incredibly useful for bulking up meals – it can be a side, part of a salad, sandwich filler, a base for soup or can easily be turned into coleslaw by adding some vegan mayo. Heat up the oil in a large frying pan and add the onion. Fry until translucent and soft. Add the pepper and continue cooking until soft. Add the garlic, chilli and fresh tomatoes and cook until heated through. Keep stirring to prevent the garlic and chilli from burning. Add the tomato puree, dried herbs, smoked paprika and sugar and continue to cook and stir until the sugar has dissolved. Add the black beans, mushrooms and grated veggies and cook for around 2 minutes before adding the tin of chopped tomatoes. Add the soy sauce, ketchup and soya mince and keep cooking until the mince has completely defrosted and heated through. Add water if the chilli seems too dry. Take off the heat and stir in the lime juice and black pepper if using. Tip: As with most tomato based dishes, this chilli is best if left to cool for a few hours (or better still, overnight) so that the flavours have chance to develop. 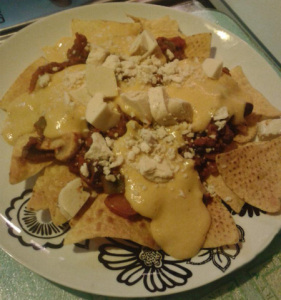 You will need to reheat however before adding to the nachos. Google search will bring up many more! Add the carrot, potatoes and all other ingredients to a food processor and whiz until smooth and uniform in colour. You may need to stop and scrape down the sides. Transfer to a pan and heat until the sauce bubbles. Stir the whole time using a silicone spatula. Taste great cold or warm! Chilli sin carne, eazy cheeze sauce, tortilla chips, vegan sour cream and a melt-able vegan “cheese”. 1. 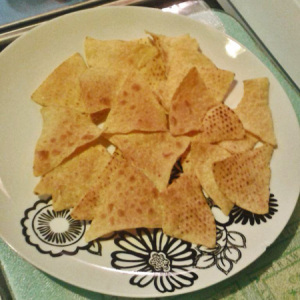 Arrange a layer of nacho chips onto a plate and pop under the grill just long enough for the edges to just start turning a pale golden brown. Don’t overdo or else they’ll burn during step 5. 2. 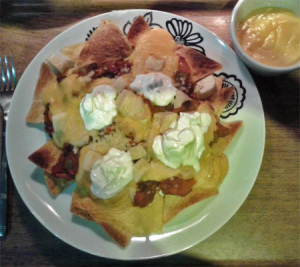 Dollop a healthy serving of hot chilli onto the top of the nachos. I like to leave an outer ring of un-topped nachos for presentation purposes. Plus it makes the chips easier to pick up and dip. 3. Add spoonful’s of the eazy cheeze sauce onto the top of the chilli. 4. Add a nice melt-able vegan “cheese” of your choice onto the top. 5. 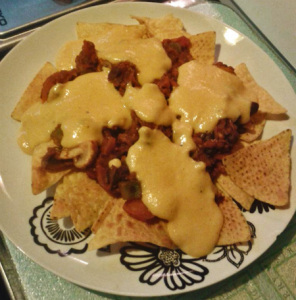 Pop under the grill until the vegan cheese has melted, the cheese sauce has gone bubbly and the edges of the nachos have started to go brown. 6. 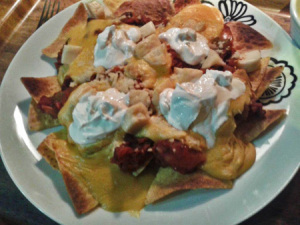 Add blobs of vegan sour cream (I used Toffuti). If I’d have had some spare jalapeños to hand, I’d have added some of those as well. Same goes for avocado… live and learn! 7. Enjoy with a nice cold beer! I would very much like to recommend Innis and Gunn: http://www.innisandgunn.com – which is my all time favourite beer, even before I turned veg*n! 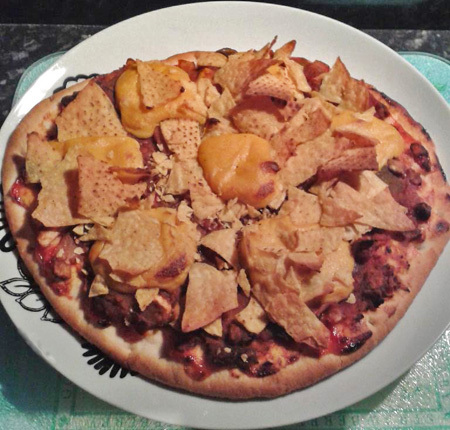 have any leftovers, you can stick them on a pizza base and have an ultimate nacho pizza – hell yes!! !